The abundant writings of Frederick II of Prussia were one of the unique traits of his rule, clearly distinguishing him from fellow eighteenth-century rulers. Whatever his specific purposes were in the act of writing, he made authorship itself a pivotal tenet of his public persona. Fellow monarchs in the late eighteenth century (such as George III in Britain or Joseph II in Austria) abandoned some of the traditional aspects of representational court culture and fashioned themselves as patriots, reformers, family men, or servants of their state. Yet none presented himself so openly in the public sphere as a philosopher, a poet, an expert-writer, a historian, or what we would today call a ‘public intellectual’ – all roles which Frederick eagerly assumed. As Andreas Pečar notes in this study, such roles were usually incompatible with the traditional attributes of a roi connétable; heavy damage could have been wrought on the monarch’s stature had Frederick been less skilful in harnessing a wide array of genres to the promotion of such self-fashioned images. To what extent did his profuse writings represent his convictions – and how can they be reconciled with his political action? Ever since the eighteenth century, these questions have traditionally stood at the centre of most discussions of the monarch’s writings. Especially in biographical accounts of Frederick II’s lifetime (1712-1786), his written works have been interpreted as ‘ego documents’, allegedly testifying to his actual views on a variety of topics. The king’s diverse activities as an author have been frequently seen as evidence of self-reflection: a thorough assessment by the monarch of his own achievements or failures (especially in the biographies by Theodor Schieder and Johannes Kunisch). In this timely and much-needed book, Andreas Pečar begs to differ. His work stands out among recent and older studies of the Prussian monarch first of all by virtue of being squarely focused on Frederick’s writings and his role as an author. This is the first book-length study of this topic since Eduard Spranger’s short account of the monarch as a philosopher, first published in 1942 – and it covers a much wider range of themes than Spranger’s work. Pečar rejects previous attempts to treat Frederick’s writings as keys to his inner feelings, views, convictions, or self-reflection. He even discards any notion of coherent authorship as far as the content of the king’s works is concerned. Pečar sees Frederick’s writings – as declared in the book title – as a series of masks donned by the monarch for specific purposes in particular contexts. Building on Erving Goffman’s renowned (if somewhat dated) The Presentation of Self in Everyday Life (1956), Pečar suggests it is futile to search for a unified or authentic self behind the different public utterances made by the king at different times. Rejecting any identification between the author and his texts, Pečar claims that precisely this interpretation – of the king’s writings as genuinely reflecting his views – was in many cases Frederick’s goal, which subsequent generations accepted unhesitatingly. Indeed, one of Pečar’s recurrent points is that historians’ accounts of the Prussian monarch over the last two centuries have been ultimately shaped by the king’s own self-presentation in his writings. Posterity and the historical profession, according to Pečar, proved much more gullible on this front than Frederick’s contemporaries – who could often see much more clearly through the monarch’s self-donned masks. Andreas Pečar’s corrective to earlier approaches to Frederick’s works is to shift the focus from the self-determining author (the protagonist of most biographical accounts) to the variety roles he assumed in and through his writings. Pečar regards the monarch’s public utterances as political speech acts in J. L. Austin’s sense (he treats virtually no work by Frederick which was not meant to be published in some manner). Therefore, Pečar calls for a new and hitherto neglected focus on the intended addressees of each of the works, or groups of writings, examined in this book. He explicitly wishes to follow Quentin Skinner’s lead in asking such questions as what Frederick intended to perform (usually in a political sense) in writing a certain work and what impact he wished to create by writing and publishing (the monarch’s Wirkungsabsicht). The book consists of a methodological introduction, eight largely thematic chapters – examining either particular genres in which Frederick wrote or a common theme – and an afterword recapitulating the main methodological and thematic insights. Beginning with an overview of the correspondence between Voltaire and crown prince Frederick (1736-1740), as well as the early Antimachiavel, Pečar describes Frederick’s early persona as a philosopher-king as an attempt to identify himself in public as a member of the circle of leading Enlightenment philosophes. In the absence of alternative means to distinguish himself as crown prince on the international stage, Frederick took up writing and publishing along the lines of what he considered to be the main views of the partie philosophique. However, accession to the throne (and dealing with Voltaire, a wily and much more experienced author) taught Frederick he would not necessarily be able to maintain control over the public interpretations of his works. Initially taken aback (banning the publication of his Antimachiavel in Prussia until his death), Frederick did not abandon authorship as a means of promoting his political goals. He was fully aware of the significance of public opinion and wished to channel it in specific directions by continuing to write and publish in different genres. Pečar dedicates two chapters to Frederick’s works on recent or contemporary history: though the king published only a History of the House of Brandenburg in his lifetime, he wrote profusely about the major events of his reign, from the Silesian Wars to the War of Bavarian Succession, in an attempt to mould future views of his rule and military acumen. The main argument here is that the author-king shrewdly used his accounts of his predecessors not to emphasise the achievements of the Hohenzollern dynasty as a whole but rather to highlight his own triumph (or, as Pečar puts it, to promote himself at the expense of his forefathers). His predecessors were explicitly and sharply criticised throughout Frederick’s history of his dynasty in yet another breach of courtly etiquette – one of many, as Frederick strove to distinguish himself in various ways from fellow monarchs past and present. A fascinating chapter examines one of the most interesting works composed by the Prussian monarch, a collection of philosophical poems entitled Œuvres du philosophe de Sanssouci, which Frederick circulated only within the small circle of his confidants (the cercle intime, which coincided at times with his famous Tafelrunde in Potsdam). This collection, encompassing radical anti-Christian views, sexually themed poems and other risqué topics, was probably first printed in 1749 (no copies of this edition survive) and reissued in 1750 and 1752. Frederick tried to maintain total control over access to this work, which became the subject of great curiosity and speculation across Europe. He suffered one of his major setbacks on the battlefield of public relations when the French government managed to obtain a copy and republished the work in 1760 in a widely accessible edition. This was an attempt to undermine Frederick’s stance as a defender of the Protestant faith during the Seven Years War and more generally his self-presentation as a virtuous, self-abnegating ruler. Pečar is interested, as elsewhere, in the intended impact of the Œuvres du philosophe de Sanssouci, making the excellent point that even this work – which was not intended for public consumption – had a well-designed political aim. Frederick used it as a token of royal trust in the recipient and thereby as an instrument of socialisation and the enhancement of group cohesion among his chosen confidants, distinguishing them from more traditional circles and venues of court sociability. Another highly unusual activity of the Prussian monarch-author was the composition of acerbic satirical pamphlets, published anonymously. In a chapter about these pamphlets, Pečar argues they were intended to ridicule Frederick’s political enemies across Europe, especially during the Seven Years War and the partitions of Poland, by presenting Prussian policy as optimally aligned with the principles advocated by some of the philosophes and casting his targets as intolerant enthusiasts. Frederick was fully aware of the reputation of pamphlet writers, as attested in his own anonymous essays against satirical pamphleteers (Discours sur les satiriques and Discours sur les libelles, 1759). Nevertheless, as Pečar demonstrates, the king readily ran the risk of being exposed as the author of such undignified pieces because he envisaged a much greater benefit, potentially compensating him for an eventual embarrassment: swaying European public opinion (and especially intellectual circles in Paris) in favour of his political designs. The topic of a further chapter is the flurry of philosophical essays the king wrote or published in 1769-1772, including apparent replies to Rousseau’s famous Discourses and reviews of recent works by Parisian philosophes, as well as the much-maligned essay on German literature (1780). Pečar identifies here a new role assumed by the monarch: that of a well-experienced teacher of humanity who distinguishes himself at this stage from the Parisian philosophes by arguing for the repression of self-interest in the service of the common good, the maintenance of social cohesion, and the pursuit of political and military glory. These essays, according to Pečar, differ from earlier writings by focusing on what he sees as the legacy of ancient republicanism. Pečar regards this energetic publishing activity around 1770 as expressing Frederick’s awareness of the recently depreciated market value of his public image as a philosopher-king. The Prussian monarch was apparently alarmed by the links forged between Catherine II of Russia and major philosophes, who praised the tsarina as the new ‘northern star’; in response, he wished to vindicate his persona as a ruler who was also a genuine philosopher and a published author. Frederick’s writings on military affairs are the subject of a telling analysis by Pečar, who suggests they should not be read as general pronunciations on the art of war but rather as communicative signals in a difficult relationship between the king and his senior officers (including his own brothers). Especially during the Seven Years War, when several strategic and tactical decisins by the Prussian monarch nearly ended in disaster, his skills as a military leader were questioned within the Prussian army. While Frederick could order a specific course of action in battle, he could not easily command the professional respect of the military establishment. Pečar argues that the king frequently used his reflections on military affairs to own up to tactical mistakes he could not have otherwise admitted in public, and which he officially ascribed to the conduct of others. A particularly rewarding section of this chapter is Pečar’s reading of Frederick’s essay on Charles XII of Sweden (Réflexions sur les talents militaires et sur le caractère de Charles XII, written in December 1759) as exhibiting the king’s readiness to discuss obliquely his own errors by attributing similar decisions to the ambitious yet ultimately unsuccessful Swedish monarch. A final chapter surveys the king’s contribution to eighteenth-century discussions of different forms of government, and especially the characteristic features of monarchy, in the wake of Montesquieu’s De l’esprit des lois of 1748. In a series of writings from 1749 (an essay on the reasons for creating and abolishing laws) to the late 1770s (treatises on patriotism and on the forms of government), Frederick repeatedly rejected Montesquieu’s classification of regimes – and especially the French author’s insistence on the significance of intermediary bodies in preventing descent into despotism. Another disagreement with Montesquieu concerned the English model of government as expressed by the King-in-Parliament principle and party politics. Frederick argued that institutional arrangements were of no consequence if the ruling bodies (i.e. mostly the monarch) lacked virtue and did not fully identify their own interest with that of the commonwealth. Pečar sees these essays as Frederick’s attempt to cover up the absolutist reality of his rule in Prussia by fashioning himself as a ‘patriot king’ (in the sense of Bolingbroke’s 1738 essay). By peddling an inaccurate albeit highly seductive image of himself as a selfless ruler who was merely the first servant of his state, Frederick II moulded his own image for posterity. Pečar seems uninterested in this aspect of Frederick’s works; time and again he discards the monarch’s arguments as ‘unoriginal’ and ‘far from innovative’ in order to legitimate a virtually exclusive focus on their political function. It is, however, not completely clear why philosophical originality should be a significant criterion for the assessment of writings composed by active political agents. As Pečar himself convincingly argues, Frederick’s public self-presentation as a philosopher was never isolated from his more general role as a monarch; as such, his intellectual output should not be judged by the benchmarks one would apply to Immanuel Kant or Jean-Jacques Rousseau. As Die Masken des Königs clearly shows, writing and publishing philosophy was an unusual occupation for a monarch. Therefore, in cases when Frederick used contract theory to explain the source of his royal authority (by contrast to kingship by divine grace), we would do well to ask which kind of contract theory he was using – for there was a finite yet diverse range of such arguments on which he could draw, and various contract theories had very different implications. The same attitude would have been helpful when approaching Frederick’s discussions of amour propre: Pečar briefly mentions that Frederick participated in a long-lasting debate over the interrelations between the care of the self and the common good, but one does not hear much about the multiple and often conflicting notions of self-love common at the time. It would have been useful to learn for which view of amour propre the king opted, as different conceptions of this term could serve his intended political goals to varying degrees. In his conclusion, Pečar criticises Johannes Süßmann’s recent suggestion that Frederick II operated within much firmer structural political constraints than hitherto appreciated. Pečar retorts that an examination of the king’s writings as political instruments emphasises his active agency beyond the limitations imposed by traditional features of the monarch’s role. One could nevertheless argue that the king surely operated within a different, discursive web of constraints. There were only so many ways of presenting oneself in the eighteenth century as a patriot ruler or as a respectable philosopher; precisely because Frederick wished to convey clear messages to specific addressees, he had to appeal to publicly accepted conceptions of patriotism, action for the commonwealth, self-love, or patronage of the arts. A more robust mapping of the contemporary intellectual terrain would have assisted readers in understanding how Frederick was making a political argument by writing a particular philosophical essay. Additionally, Pečar frequently seems to delight in exposing the mismatch between Frederick’s self-presentation as championing Enlightenment values within (or beyond) his territories – and, on the other hand, the monarch’s harsh conduct on the ground. This discrepancy between word and deed is criticised especially in the case of Frederick’s campaign against the Polish confederates and, more generally, in relation to the structural absolutism in contemporary Brandenburg-Prussia. Here too, however, it is not entirely clear why the lack of congruence between political action and written work should constitute such a serious ground for rebuke if one assumes from the outset that the king’s writings were meant to create certain impressions among particular addressees. In these cases, Pečar’s sharp critique of the discrepancy between Frederick’s writings and action appears to reflect an expectation criticised elsewhere in Die Masken des Königs: namely, that the Prussian monarch’s political demeanour should have mirrored the principles avowed in his published works. As mentioned above, these points should not diminish Pečar’s substantial contribution to existing scholarship in this clearly written and original book. 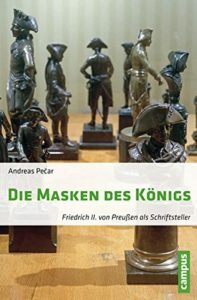 In its widely ranging and fascinating analysis of the political aims pursued by the Prussian monarch in his writings, Die Masken des Königs has uncovered and reclaimed an understudied aspect of an otherwise well-researched figure. This in itself is no mean feat; Andreas Pečar is to be commended for bringing to light hitherto vague features of the output of a monarch who has been traditionally regarded as a major figure of the Enlightenment – whatever one may think of this controversial term. J. L. Austin: How to Do Things with Words, Oxford 1962. On this episode, see Thomas Biskup: Die Schlacht von Sanssouci: Der roi-philosophe und die klandestine Literatur im Siebenjährigen Krieg, in: Krieg und Frieden im 18. Jahrhundert: Kulturgeschichtliche Studien, ed. Stephanie Stockhorst, Hannover 2015, 75-92. See the essays collected in Quentin Skinner, Visions of Politics, I: Regarding Method, Cambridge 2002. Quentin Skinner: Reason and Rhetoric in the Philosophy of Hobbes, Cambridge 1996, and Quentin Skinner: Hobbes and Republican Liberty, Cambridge 2008. Johannes Süßmann: Staatsmann – Augenzeuge – Analytiker. Ercheinungsformen Friedrichs II. in seinen Geschichtswerken, in: Repräsentation und Selbstinszenierung Friedrichs des Großen, eds. Jürgen Luh and Andreas Pečar (Friedrich300-Colloquiuen 8). URL: http://www.perspectivia.net/publikationen/friedrich300-colloquien/friedrich_repraesentation/suessmann_geschichtswerke (accessed 21 March 2017). Dieser Eintrag wurde veröffentlicht in Buchbesprechungen und verschlagwortet mit Aufklärung, Friedrich II., Schrift von Jürgen Luh. Permanenter Link zum Eintrag.